pirited dancers. Handsome horses carrying exquisitely garbed riders. Floats depicting episodes of Santa Barbara history. Antique carriages. Colorful costumes. Put them all together with music, flowers and laughter and you have El Desfile Hist�rico, or historical parade, which serves as a centerpiece for Santa Barbaras summer Fiesta celebration. A 73-year tradition, the 1997 version will follow the familiar parade route from the ocean at Cabrillo Boulevard up State Street through downtown Santa Barbara. Upwards of 50,000 spectators are expected to line curbs and balconies to view what is always a feast for the eyes. 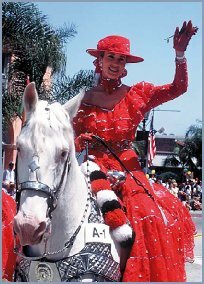 This years parade, one of the largest equestrian parades in the nation, kicks off at 12:00 p.m., Aug. 1 at Cabrillo Boulevard and Castillo Street near the harbor. Be prepared for a kickoff like no other. For the first time ever, there will be a "Run with the Bulls," a spoof of the annual event in Pamplona, Spain, to begin the festivities. A group of local runners will hoof it up the parade route, chased by other runners wearing papier-mache bull heads. The event is the brainchild of El Presidente Michael Danley, who was inspired last year by a group of serape- and sombrero-festooned runners whose presence thrilled the throng at De la Guerra Plaza. After the bulls come the flower girls, Fiesta's petite official hostesses, aged 7 to 15, attired in their white blouses and colorful skirts. At the head of the marchers, representing the spirit of the day, is the Senior Spirit of Fiesta, a young woman chosen in annual competition for her dancing ability, who dances throughout the nearly two-mile parade route. Carriages carry dignitaries including Fiestas El Presidente, and city, county, state, and Old Spanish Days officials. In an annual tradition, a float bears the woman chosen to portray this years St. Barbara. There are also mariachis and marching bands, mounted sheriffs posses from Southern and Central California, other riding and dancing units, and historic vehicles. Last years parade drew nearly 100 separate entries from Andalusians to youth bands, with 1997 expected to crest the century mark.